‘Papay-Stronsay is a pleasant little island that lies very near, and, as it were, in the bosom of the former [Stronsay], on the north-east quarter, the circumference of which does not exceed three miles ; and as it is of a level surface, distinguished alike for its beauty and fertility, it furnishes a very comfortable abode for a pretty extensive farmer, with his servants and other dependants, who make a part of the congregation of Stronsay. The island appears on the majority of early maps and is generally referred to by its full name (Blaeu 1654; Adair 1682; Wallace 1693; van Keulen 1695; Moll 1745; Mackenzie 1750; Sawyer and Bennett 1781; Eunson 1795; Depot Generale de la Marine, Paris 1803; Thomson 1822; Blachford 1846; Thomas, Becher and Thomas 1853). Papa Groina, a shoal to the north east of Papa Stronsay, is also depicted on several occasions (Mackenzie, 1750 in Thomson 1996, 85; Sawyer and Bennett 1781; Depot Generale de la Marine, Paris 1803; Thomson 1822; Thomas, Becher and Thomas 1853), although it is not present on the OS First edition map; groin, grunn or grunka denote a shoal or shallow bank in the sea, often a shallow fishing ground (Marwick 1927, 80; Jakobsen 1936, 159). Papa Stronsay was a 12d land, paying 22 meils bear in teynd, when set in feu to David Scollay, as part of the king’s lands on Stronsay, in 1595 (REO, no. II, 85, 89). In 1617, a Jacob Scollay held 12 denariates of land in Papa Stronsay, described as lying in the parish of St. Peters (Retours, no. 5; Monteith 1845, 6). One family occupied the island in the early eighteenth century (Brand 1701, 54), although several families are mentioned as being present just over a century later (Simpson 1841, 157), the latter figure perhaps reflecting the total population, rather than just the main tenant and his dependants. The island, largely because it was amply provided with shell sand, was noted for its fertility; it is described as ‘lying flat with corn fields, which have been stimulated by plenty of ware, to raise luxuriant crops of grain’ at the end of the eighteenth century. Much earlier we learn from OS that Earl Rognvald went to the island to collect malt for the Christmas brewing (OS, chap.29; OSA, 298; Lamb 1995, 16-7; see below). Throughout the medieval period, Stronsay appears to have been divided into three parishes (Clouston 1918, 239). The parsonage revenues of the northern and central parishes - dedicated to St. Peter and Our Lady respectively - along with the islands of Eday and Faray, pertained to the mensa of the bishop of Orkney from an early date and remained so at the Reformation (FES, Vol. VII, 261, 272; Cowan 1967, 58). In 1544, the vicarage teinds were assigned to the treasurer of Orkney, although the vicarage seems to have retained its independence (ibid.). The southern part of Stronsay formed the parish of St. Nicholas and, apparently conjoined with North Ronaldsay, was a prebend of Kirkwall in 1429 (Cowan 1967, 172, 193). The parsonage teinds were assigned - with those of the other two parishes and Eday - to the treasureship of Orkney in Bishop Reid’s reconstitution of the bishopric in 1544. The report on the teinds of the Orkney parishes of 1627 mentions three kirks on Stronsay; however, there was only one minister for the island, the implication being that a single church, in the middle of the island, was all that was necessary (Peterkin, no. III, 95). Even the sole surviving parish church, the Lady Kirk, was in a ruinous state by 1779, being in need of ‘great repairs’ (OSA, 332). A new church had been built in 1727 and was replaced in 1821, but there is now no trace of it within the graveyard, which remains in use (Simpson 1841, 166; Gibson, 1991, 52; RCAHMS 1946, 333, no. 978; RCAHMS 1984, 28, no. 148; NMRS no. HY62SW6, SMR no. OR 167). The parish of St. Peter’s encompassed the northern third of the island, including Papa Stronsay and it is perhaps significant that the parish church itself lay at North Strenzie, on the Stronsay side of Papa Sound (NB, Orkney, Book 24, 31; Marwick 1927, 69, 71; RCAHMS 1946, 331, no. 960 & 333, no. 974; Gibson 1991, 22, Appendices 4 & 5; NMRS no. HY62NE4, SMR no. OR 128). The foundations of St. Peter’s church, which were still visible in 1879, were ‘hopelessly confused and overgrown’ when visited by Lamb in 1983; however, he thought the site to be characteristic of an Orkney ‘Peterkirk’, particularly as it appears to lie over part of a large settlement mound from which stonework protrudes (NB, Orkney, Book 24, 31; RCAHMS 1984, 29, no. 153). Further, the placename, Curkabreck or Kirkabreck, which lies on the south side of the peninsula enclosing Papa Sound, suggests the possibility of another chapel in this vicinity; a building on a small skerry off Mill Bay was locally thought to be a chapel (Marwick 1927, 71; RCAHMS 1984, 31, no. 173; Gibson 1991, Appendices 4 & 5; NMRS no. HY62NE23, SMR no. OR 1016). In addition to the parish church, Anderson records that there were at least four chapels on Stronsay, two of which were on Papay (ibid., 418; see below). Traces of chapels were also believed to have been located on three of Stronsay’s four pasture isles - Linga, Meikle and Auskerry (Anderson 1794, 419). That on Auskerry was dedicated to the Virgin Mary and was traditionally founded by a shipwrecked sailor; associated earlier settlement - described simply as ‘heaps of debris’ by the RCAHMS - was known as a ‘munkerhoose’ (RCAHMS 1946, 337, no. 1001; RCAHMS 1984, 34, no. 194; NMRS no. HY61NE10, SMR no. OR 930). Meikle, although sometimes thought to be the largest of the two Linga isles (Marwick 1927, 70), is more likely to be Muckle Green Holm, which also contains a probable monastic site (RCAHMS 1984, 7, 21, no. 88 & 89, SMR no. OR 928 & 933). On Linga, there are a series of rectangular enclosures, probably representing a medieval farmstead, underlying a later sheep shelter (NB, Orkney, Book 24, 44; RCAHMS 1946, 336, no. 994; RCAHMS 1984, 37, no. 217; NMRS no. HY62NW12, SMR no. OR 996). Lamb has also identified a probable hermitage site on a stack, known as Tams Castle, off the south east coast of Stronsay (NB, Orkney, Book 24, 154; Lamb 1980, 517-9; RCAHMS 1984, 29, no. 157; NMRS no. HY62SE29, SMR no. OR 132). The fact that Speed’s map of 1610, although it does depict three churches, shows dedications to St. Magnus and St. Olive (Olaf), alongside St. Nicholas, hints at the dedications of the chapels on Stronsay itself (cf. Marwick 1927, 70-1; Gibson 1991, 22-3, Appendices 4 & 5). The OSA, 327, notes the five parish kirks and nine chapel sites, while Marwick mentions fifteen chapels and Gibson lists nineteen certain or possible sites ( Marwick 1927, 70-1; Gibson 1991, 15, 22-3, Appendices 4 & 5). On Papa Stronsay, the dedications of the two chapels are given consistently as St. Bride and St. Nicholas (OSA, 326; Barry 1805, 51; Neale 1848, 113; Stuart 1856, 14). Neale describes both as appearing ‘to have been very small, and rather places of pilgrimage than of regular office’ (Neale 1848, 113). A third chapel site is mentioned in the Name Book, which ‘cannot now be pointed out’ (NB, Orkney, Book 24, 23). The two known sites lay close together, in the south eastern part of the island. Although no traces of St. Bride’s are visible today, the outline of the chapel could still be traced in the 1850’s (Stuart 1856, 14). The site pointed out to Lamb in 1979 lies immediately in front of the farmhouse, the present Papa Stronsay House; a shed stood on this site earlier in the twentieth century (RCAHMS 1984, 39; see below). The chapel and farm lie above a sandy bay on the south side of the island; a field to the east of the farm is known as Ham, from the ON for harbour, while the beach is known as Bountifur, the meaning of which is far more obscure (Marwick 1927, 74, 77). To the north of the farm steading, a font was discovered near an old water pump in 1999; it had been carved from a block of red sandstone and is roughly octagonal in form, with an incised equal-armed cross at the base of the bowl and what are probably fixture points for a wooden cover near the rim (Buteux, Hunter and Lowe 1999a, 68; NMRS no. HY62NE41, HY 6662 2927). Although it could be from either chapel, the font was found marginally closer to the traditional site of St. Bride’s chapel (Buteux, Hunter and Lowe 1999a, 68). ‘St. Nichola’s chapel was almost entire twelve years ago ; the dimensions within walls 15 feet by 12; the quire 7 feet by 9; this quire is covered with a complete stone arch, but the chapel hath been lately demolished by the tenant, in order that he with the stones of it might build a new barn. St. Bride’s chapel and Quire, now in ruins, are nearly of the same dimensions as those of St. Nicholas’ (Anderson 1794, 418). The low, turf-covered footings of St. Nicholas’s chapel, oriented east-west and consisting of nave and chancel, appear to confirm Anderson’s description (1794, 418; RCAHMS 1946, 336-7; RCAHMS 1984, 39; Buteux, Hunter and Lowe 1998, 72; Buteux, Hunter and Lowe 1999b, 68; Lowe, Buteux and Hunter 2000b, 67-8). Prior to important recent excavations no wall faces were evident and the wall thickness could not be ascertained, but full details are now known: the nave was found to measure 5.3m by 3.95m wide, while the chancel was approximately 2.7m long by 2.5m wide, over walls 0.6m broad and 0.3m high (information from OS surveyor, 1970; Lowe 2002, 87). The chancel appears to have been an addition to an earlier single-celled structure, perhaps in the twelfth century, and there may also have been an intermediate phase, when the chancel was slightly wider than it is now (Buteux, Hunter and Lowe 1999b, 68; Lowe, Buteux and Hunter 2000b, 68). If the chancel was barrel vaulted, the chapel may have been similar in appearance to the Crosskirk at Tuquoy, Westray. The walls were plastered internally and a central doorway, subsequently blocked, was revealed in the west wall of the nave (Buteux, Hunter and Lowe 1998, 72). The primary floor level within the chapel had been almost entirely removed, while the collapsed west gable and the lintel of the door were clearly visible external to the chapel. An altar, made up of mortared masonry, was located against the east wall of the chancel, while there were two smaller, drystone altars in the north east and south east corners of the nave, at least in the chapel’s final phase (ibid. ; Buteux, Hunter and Lowe 1999b, 68; Lowe 2002, 87). A large upright stone formed the frontal of the two altars in the nave, with a kneeling stone in front of each (Lowe 2002, 87). Below the make-up of the secondary floor was an earlier floor level from which were recovered three fragments of a yellow sandstone slab, while a fourth conjoining fragment was recovered from an unstratified context (Buteux, Hunter and Lowe 1999b, 68; Lowe 2002, 88-9). The four fragments form what is clearly an altar slab (Fig.01.3), probably from one of the altars in the nave; the fragments were found set face downwards in different areas of the nave floor, perhaps reflecting accidental breakage, followed by ‘ritual’ burial (Lowe 2002, 89). The slab has a chamfered edge, while three saltire crosses and one slightly skewed cross, contained in compass-drawn circles, are incised into what must have been its upper surface; a fifth cross must have lain in the now missing lower, left-hand corner of the slab (ibid., 88-90). The terminals of all four crosses are punctuated by drilled holes. A hollowed sandstone basin, possibly a water stoup or piscina, was found amongst the make-up of the secondary floor (Lowe, Buteux and Hunter 2000b, 68). To the south of the chapel, several short stretches of drystone walling, plus part of what appeared to be a stone-flagged pathway, were noted along the eroded shoreline by most twentieth century visitors to the chapel (information from OS surveyor, 1970; RCAHMS 1984, 39, no. 228; Wilson and Moore 1996, 81). Recent survey and excavation has confirmed that the chapel does appear to lie at the centre of a small, possibly polygonal enclosure; although no entrance is apparent, it may have lain to the south or south west of the chapel, where it has subsequently been eroded away (Buteux, Hunter and Lowe 1998, 72; Lowe 2002, 88). An earlier enclosure wall, relating to the pre-chapel occupation of the area and possibly of several phases, was also recorded inside the north part of the graveyard wall and extending beyond it to the west; a stony bank, presumed to be the end of this boundary, within which was set the base of a large orthostat, was picked up in the south west part of the site (Buteux, Hunter and Lowe 1999b, 68; Lowe, Buteux and Hunter 2000b, 67-8; Lowe 2002, 91). Evidence for a corbelled building of oval shape lay below the nave and extended to the north (Buteux, Hunter and Lowe 1998, 72; Lowe 2002, 91). The structure was approached from the south by a neatly flagged pathway, which extended from the present cliff edge; a small fragment of green porphyry came from a fill deposit above the floor and a rectangular stone setting, with the stump of an upright stone at the east end, lay in the centre of the building, suggesting it may have been of ritual significance (Buteux, Hunter and Lowe 1999b, 68; Lowe, Buteux and Hunter 2000b, 67-8; Lowe 2002, 91-4). A sub-rectangular building, aligned NE-SW, lay under the east end of the chancel and extended to the east; it lay at the same level as the cellular building and may, therefore, be contemporary, particularly since it had been largely robbed out (ibid.). In the centre of the floor was a slab-lined hearth, full of charcoal and carbonised grain (Lowe, Buteux and Hunter 2000b, 67-8; Lowe, Buteux and Hunter 2001, 72). Further lengths of walling and areas of paving were revealed to the north east and west of the chapel - and also extended beneath it (Buteux, Hunter and Lowe 1998, 72; Buteux, Hunter and Lowe 1999b, 68). Overlying the paving to the north east of the chapel was a shell-rich midden; although only partially excavated, a few sherds of coarse pottery, probably of Iron Age date, two line sinkers and a fragment of bone comb, were recovered (Buteux, Hunter and Lowe 1999b, 68; Lowe 2002, 91). A section along the cliff edge revealed an area of cobbling and possible paving, delimited on the seaward edge by a stone wall (Buteux, Hunter and Lowe 1999b, 68). On the landward side of this wall, were the remains of what appeared to be a small stone platform, tentatively identified as a leacht (a free-standing ltone altar as found in early Irish monastic enclosures). 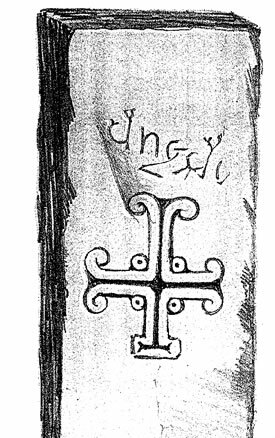 A small rectangular slab, now lost, bearing an ornamental and sophisticated cross, outlined with a double bead moulding (Fig.01.4), was dug up near St. Nicholas’s chapel during its removal (Stuart 1856, 14, Plate XLII; Allen and Anderson 1903, 24-5; RCAHMS 1946, 337; Radford 1962, 173-4; Fisher 2002, 47). Parallels for both the cross and the inscription can be drawn from Northumbria, Iona and elsewhere along the western seaboard of Scotland, as well as from western Ireland (Fisher 2002, 47). The stone was found about twenty yards from the foundations of the chapel, at a depth of three to four feet. Large quantities of human bones were noted around the stone and the chapel, and the stone itself might have been from a grave (Stuart 1856, 14; Lowe 2002, 86). The contracted minuscule inscription, which slopes across the slab above the cross, has been interpreted as standing for D[OMI]NE D[E]I [O’ Lord God] (Rhys 1892, 291; Rhys 1898, 372; Radford 1962, 173-4). The slab is probably of seventh or eighth-century date (Radford 1962, 173-4) and therefore predates the chapel in its current form, although it may relate to the structures underlying it. Burials, some of which had been redeposited, have been found inside and outside the building; a long cist was found under the south east corner of the chapel, while a dug grave, containing a child, lay in front of the step leading into the chancel (Lowe 2002, 91). A grave containing two slightly flexed burials, probably of pre-Christian date, was found along the cliff edge and a number of other stratigraphically pre-Christian burials have been identified within the enclosure (Lowe, Buteux and Hunter 2001, 72; Lowe 2002, 91). However, burials have not been discovered in great number, nor has the depth of soil encountered been enough to corroborate Stuart’s nineteenth-century description of the discovery of the cross slab (Lowe 2002, 91). The presence of the three altars in St. Nicholas’s, which also occurs in the chapels on the Brough of Birsay and on St. Ninian’s Isle in Shetland, implies a degree of sophistication which is reflected in the building as a whole (ibid., 87-8). If, as Anderson implies, the chapel at St. Bride’s was similar in form, both the Papa Stronsay chapels would appear to be of high status (ibid., 86). In its first phase, St. Nicholas’s was probably no earlier than the eleventh century in date, reaching its final form in the twelfth century (ibid., 86, 94). The pre-chapel levels on the site do not fit happily with a late Iron Age domestic context (largely because of the paucity of finds) and, given the nature of the oval structure and the lost eighth century cross slab, it is possible that they should be associated with the eponymous papar (ibid., 94). This phase of occupation had, however, long ceased by the time the later chapel was built, although it is possible that memories of the site as a sacred place persisted to explain its later re-use (ibid.). Associations between some ‘papar’ places and the earldom family have been noted (Thomson, 2001, 16). In the case of Earl Rognvald’s death and burial c.1046 the connection is with both Papa Stronsay and Papa Westray. Rognvald had left Kirkwall, where he had recently settled for the winter, to fetch malt from Papa Stronsay for the Christmas ale brewing. While he and his men sat around the fire at night, Thorfinn the Mighty, with whom Rognvald had shared the earldom of Orkney on increasingly acrimonious terms, secretly approached the house and attempted to burn all its occupants alive. Although Rognvald escaped, he was found on the shore where he was killed; his body was taken to Papa Westray for burial (OS, chaps.29,30; see Site O2). The spot where Rognvald died may have been Ronald’s Geo, located on the north side of the island; although the name is marked on the OS First edition map and on the current edition of the OS 1:10000 map, it was no longer remembered locally at the beginning of the twentieth century (Marwick 1927, 66, 81). Rognvald is said to have escaped from the house, because he was dressed in a long linen robe or nightshirt and so was mistaken for an ecclesiastic. Whatever one makes of this detail it is exceedingly unlikely that there would still have been ‘papar’ on the island in the mid eleventh century, as Marwick surmised (Marwick 1927, 66; Lowe 2002, 86-7). A more likely explanation is that Rognvald actually disguised himself as a priest in order to escape (Taylor, trans. OS, 366). The farm at which Rognvald was staying has not been identified, but it almost certainly lay near the present steading of Papa Stronsay House at HY 6660 2919 (Marwick 1927, 65-6; Taylor, trans. OS, 366, note 6; RCAHMS 1984, 39, no. 226; Lamb 1995, 16-7; NMRS no. HY62NE26, HY 66 29, SMR no. OR 175). The possibility that this is a Norse period site is indicated by older buildings on the east side of the farmhouse, partially evaluated in 2000 (Lowe, Buteux and Hunter 2000a, 67; the building is located at HY 6665 2918). One building (12.85 x 3.55m, 0.6m wide and up to 1.65m high), was aligned NW-SE; traces of earlier foundations were visible at the north-west end of the structure, while a fragmentary stone wall, on an E-W alignment, was revealed below the stone floor (Lowe, Buteux and Hunter 2000a, 67). Abutting the building was a levelled spread of midden material, up to 0.6m deep, from which two fragments of steatite were recovered (ibid.). ‘About half way between these chapels, there is on rising ground, called the Earl’s-know, the appearance of old ruins and graves; one of which graves, evidently defined by two stones, one at the head, the other at the feet, is eight feet and a half long; this grave was dug up to the deepness of about six feet, in the month of July 1792; the stones at the head and feet, which appeared about a foot above the surface, reached to the bottom of the grave. Many human bones of an ordinary size were found, and, moreover, fragments of a human skull, and of a lower jaw bone, with the case of teeth, which were perfectly sound, and fragments of thigh bones; these were all of an enormous size, and afforded a convincing proof that the body burried there had required a grave of the dimensions above specified’ (OSA,326-7). The Earl’s Knoll is in fact a long cairn; it lies due east-west just above the 5m contour, and although now turf-covered, there is no evidence for any graves or of any excavation on the top of the mound (RCAHMS 1946, 336, no. 998; RCAHMS 1984, 38, no. 223; Davidson and Henshall 1989, 115-16, no. 14; NMRS no. HY62NE13, HY 6682 2920, SMR no. OR 170). It is traditionally believed to be the grave of a knight, whose corpse was found on the shore clothed in full armour (NB, Orkney, Book 24, 39). There are a number of other probable burial cairns on Papa Stronsay, including Doocot Knowe (NB, Orkney, Book 24, 23; Marwick 1927, 64; RCAHMS 1946, 336, no. 997; RCAHMS 1984, 38, no. 224; Lowe, Buteux and Hunter 2000a, 67; NMRS no. HY62NE12, HY 6652 2998, SMR no. OR 169). Although it lies on the highest point of the island and was - according to the Name Book - supposed to be a broch, later authors have thought Doocot Knowe more likely to be a round cairn. If not a broch, it does highlight the lack of an obvious focus of later Iron Age settlement on Papa Stronsay and reinforces the significance of the remains discovered around St. Nicholas’s chapel. The only other indications of early medieval activity on the island are the ‘Viking graves’ recalled by a former inhabitant of the island (Lowe, Buteux and Hunter 2000a, 67; NMRS no. HY62NE52, HY 6653 2965). A stone setting found during recent survey work recalls the description closely, offsetting somewhat the obvious differences in location (NMRS no. HY62NE54, HY 6691 2952). At present, the other recorded sites of archaeological significance on the island are all of post-medieval date. Ordnance Survey, 1879 (1882). First edition. 1:10,560. Sheet XCII. Ordnance Survey, 1879 (1881). First edition. 1:2,500. Sheets XCII.4 and XCII.8. Ordnance Survey, 1900 (1902). Second edition. 1:2,500. Sheets XCII.4 and XCII.8. Ordnance Survey, 1975. 1:10000. Sheet HY62NE. 17In spite of this, Papa Stronsay was described as an inconvenient isle to reach in 1848 (Neale 1848, 113).